The Natural Scoop ice cream truck is thrilled to announce that it won a 2015 American Graphic Design Award for its unique brand and attractive logo. The American Graphic Design Awards honor outstanding new work of all kinds: print, packaging, point-of-purchase, internet, interactive and motion graphics. 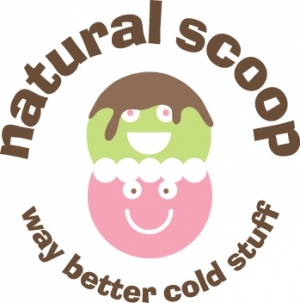 The Natural Scoop partnered with Langton Cherubino Group to create the logo and way better cold stuff tagline. “We’re on a mission to change the world, one healthier treat at a time,” said Carin Crook, co-owner. “Langton Cherubino Group was the perfect firm to help put our vision into a kid-friendly and adult-approved brand.” Watch this video to see the concepts behind The Natural Scoop’s branding. The Natural Scoop is a Fairfield County-based business that provides a new spin on an old concept, an ice cream truck that offers all natural frozen treats with no chemicals or artificial anything, ingredients you can pronounce, and taste you will love, with many options for people with specific food allergies, sensitivities, and/or preferences. The Natural Scoop serves customers of all ages, from corporate events to private events, customer appreciation events to school events, weddings to bar mitzvahs, and so much more. Visit thenaturalscoop.com for more information. Langton Cherubino Group is a communications firm dedicated to improving the way that businesses and their audiences interact. Learn more at langtoncherubino.com.